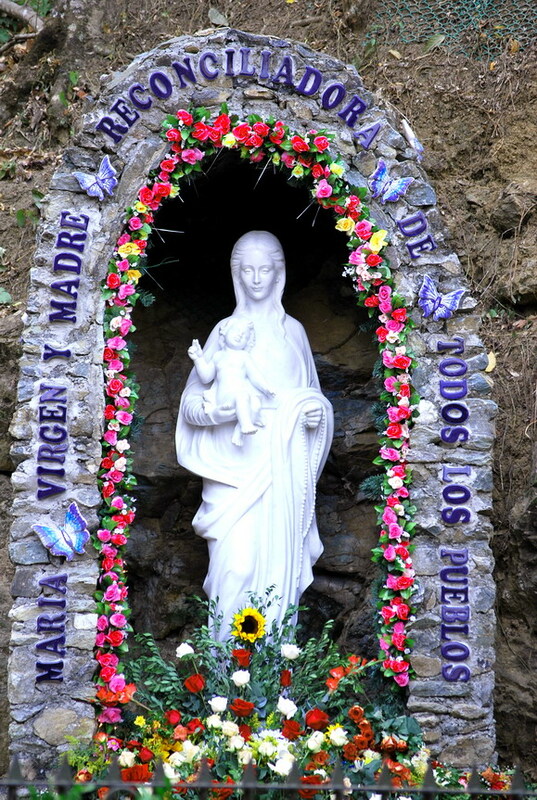 Here you will find up-to-date information for the apparitions of Our Lady Mary in “Finca Betania”, Venezuela, under the title of “Mary, Virgin and Mother Reconciler of all People and Nations”. Apparition officially approved by Bishop Pio Bello Ricardo on November 21, 1987. Mrs. Maria Esperanza, through earlier messages of Our Lady, was already aware of the existence of Her land. Our Lady, on numerous occasions spoke about a Holy Land which would be “The New Ark of Salvation”. On March 29, 1974, Mrs. Maria Esperanza recognized the land from the description she received in the messages, for it coincided perfectly with the place: The old house, the sugar mill, the sugar cane and coffee plantation, and the grotto with crystal clear water. The symbolic confirmation that it was the announced and chosen place of Our Lady was made to Mrs. Maria Esperanza through the sign of a blue butterfly. In messages received many years before, Our Lady announced that when Mrs. Maria Esperanza found the land She would manifest Herself through the wings of a blue butterfly. This occurred when Mrs. Maria Esperanza found the Holy Land and suddenly from its grotto a blue butterfly fluttered over the place. This reaffirmed what had been announced through the messages in a simple, but very beautiful way. At present the blue butterfly appears during many special moments flying from the grotto, then fluttering over the terrace, and then disappearing into the vegetation. Two years later, on March 25, 1976, just as it had been announced, the Holy Mother of God appeared for the first time in Betania, under a new title, Mary Virgin and Mother Reconciler of People and Nations . After this beautiful experience, Our Lady continued to appear in the following years, but it was only until 1984 when She appeared to one hundred and fifty persons, who testify to seeing Her clearly and distinctly. This was a very diverse group: Children, college students, adults, military men, physicians, psychologists, psychiatrists, engineers, judges, etc. From that moment, an investigation by the Bishop of the dioceses of Los Teques, Miranda State, Monsignor Pio Bello Ricardo, began and ended with an official approval. This was issued in a Pastoral Letter where he declared that the apparitions in Finca Betania were authentic and of a supernatural character. Therefore the site should be considered as sacred, and that it must be kept as a place for pilgrimage, prayer, reflection and worship. Where liturgical acts may take place according to the rules of the Roman Church. Due to the influx of visitors and pilgrims from Venezuela and from other places of the world, the Sanctuary is open all year round from 7:00 a.m. to 6:00 p.m. The Bishop has also designated seven Marian Feast days during which all night vigils are permitted: February 2, Our Lady of Candelaria; March 25, The Annunciation; May 13, Our Lady of Fatima; July 16, Our Lady of Mount Carmel; August 15, Our Lady’s Assumption; October 12, Our Lady of the Pillar; and, December 8, The Immaculate Conception. Betania is a land full of mountains that is located on the Km. 11 of the road between Cua and San Casimiro in Miranda, Venezuela. It is 65 Km. from Caracas city, the capital. Its main access is by a highway that goes from Caracas to the city of Charallave, where there is a detour to the city of Cua. Then, from Cua following the road to San Casimiro, approximately after 12 Km., stands the entrance of Finca Betania on the left hand side. It is an area surrounded by small hills that is embellished with tropical vegetation. At the entrance there is a parking lot for vehicles and buses. Then, there is a pedestrian bridge that was built over the Tarma River, which crosses the farm from West to East. The bridge leads to a square and to the grotto, the site where most of the apparitions have taken place. On the square, an open Church has been erected. The name, Betania comes from the original name the farm already had. This land was offered to be purchased to the Bianchini, Andreu and Castellano families. And when Mrs. Maria Esperanza Medrano de Bianchini saw it, she felt it was the land God had promised her from the beginning of her mission. Long before Mrs. Maria Esperanza married, the Lord had told her that she would have a land of great spiritual importance. He would offer it to her when the time was right, and its significance was that it would be a land of promises. From 1957 to 1974, Mrs. Maria Esperanza felt the inspiration to visit many sites throughout Venezuela. One day, a gentleman offered Mr. Geo Bianchini and Engineer, Jesus Andreu – who were working together – a farm that was for sale in Valles del Tuy. They made the decision to go and see the place, Mrs. Maria Esperanza agreed, so they set the day to visit the land. March 29, 1974 was the day they chose. Three families (Mrs. Maria Esperanza, Mr. Geo, Mr. Andreu, Mrs. Luisa de Andreu and Mr. Castellano), the owner, Dr. Rafael Perez and the vendor, Mr. Hicle gathered at the site. They all visited the place, and then they spoke about all the details. The main harvest of the farm was represented by sugar cane, there were over 20 planted hectares. Besides, it had a good sugar mill that produced “papelon”, many fruit trees, and a small group of fowls. The farm was well cared for and was very nice, it had a house that had been rustically built in a typical tropical style, and it had a calm river that crossed it that was fully flowing due to the summer season; all this made it appear like a true paradise. Mrs. Maria Esperanza agreed and they made the decision to purchase the farm. The conditions were considered to be good, and the owner tuned out to be a very fine person. He said that he had founded the farm himself purchasing three farms that were together, and named it BETANIA, because of the place where Jesus of Nazareth used to go and rest with his friends. Then they learned that this gentleman was part of an Evangelic group from Caracas, and that they would go to the farm with many of his friends to celebrate collective baptisms by bathing in the river, as well as group prayers. For all these reasons, it was concluded that it was truly the place that corresponded with the indications that had been announced by Our Lady. When they left the place they all felt happy and content, because it seemed to them that they had spent that time in another dimension of absolute peace and calmness. Mrs. Maria Esperanza confirmed that it was the chosen place since the beginning, that it was the site where a divine design of immense proportion would be carried out, and where great events would also take place. Two years later, on March 25, 1976, this was proven with the apparition of Our Lady to Mrs. Maria Esperanza at the grotto. She was with 80 friends, and although they were not able to see her, they witnessed phenomena associated to the apparition. On March 25, 1984 “the great apparition” of Our Lady took place, to a group of more than 108 people. They all saw her clearly and sharply, so they gave their oral and written affidavit to the Bishop of the dioceses, Monsignor Pio Bello Ricardo (+), who after thoroughly studying the testimonies, gave his approval with a Pastoral Letter. How does Our Lady Appear? According to the affidavits of the witnesses, Our Lady appears in a heavenly way, “She appears out of nowhere… She materializes…” resembling on many occasions Our Lady of Lourdes, but also resembling Our Lady of the Miraculous Medal, Our Lady of the Pillar, Our Lady of Coromoto and many other well known titles. She appears all of a sudden filled with light, most of the time accompanied by a strong, but delightful scent of roses, and other mystical phenomena, such as: Heavenly sounds of songs by “invisible choirs”, spinning of the sun, etc. There are a great number of testimonies of the events occurred in Finca Betania. In this section we have included some of them. I believe that it is my duty to narrate the following event to you as a Minister and the Representative of the dioceses of Los Teques. In such a way I will comply with the Holy Doctrine of testifying a true and veritable fact, for it will reaffirm and purify the heart of a Christian People. Thus, moved by a profound heartfelt sentiment, I will leave a trace of a small ray of light to shine upon the heart of many. You stand for a determined sector, sheep of your sheepfold, who need to be led with steady hands and with the judgment of the Good Shepherd who understands his flock. I bear witness of something special, a Mother, Mary, Virgin and Mother of the Church who appeared in these times as: Mary, Reconciler of People . A title which leads us to reflection and to elevate our spirit. Before Her presence, graces are received, and the moral essence held in the Commandments of Her Son Jesus Christ is understood; principles of love, the way of truth and life, are the only route to God! Mary, Virgin and Mother appeared to call us… so we will make amends and discover perfection in Jesus. Forgiving, blessing and glorifying He continues to give the Fire of His Love to His people through His teachings. It is a continuous song of peace, of forgiveness and of mercy, redeeming many souls. Now then, Our Lady appeared in all Her splendor, grace and spiritual depth on the top of a small, green (hope), hill, in the midst of rocks, resembling a grotto. Water from the streams sprouted forth and fell over it. She appeared as Our Lady … and we saw Her there all embellished in white, splendorous, caressing, all light, all love, all extraordinary beauty of magnificent splendidness filled with Divine Perfection! Behold a wonderful sight, never seen before… Her garment was white and pure like thick bundles of cotton, with Her Hands over Her Chest. She had a blue sash around Her Waist and a rosary on Her right Arm inviting us to prayer. She extended Her Arms and Hands filled with light, an insinuation to shelter us in Her Heart to sweetly embrace us as She embraces Her small Child, the Heavenly Cherubim… Jesus in us and we in Him! This Mother through Her presence offers us so much safety! She provides us with much joy! What kindness! This is the truth a group of souls have lived since March 25, 1984 whom united, have shared the good ways of the sincere. In Betania of the Holy Waters, that Mother, all kindness and tenderness gives Herself fully to us to meet us and to reconcile us with our brothers; analyzing each one’s virtues in order to embrace one another, covered with the protective power of trust, rectitude and human wisdom. Therefore, the admirable teaching of a day of light which filled our hearts with extraordinary experiences, endowing us with harmony and inner peace, that is to say, the holy privilege of announcing to the world this Good News for the future… The Divine Kingdom of the Spirit among the children of a people calling for justice, where justice will triumph, where love will flourish in the hearts… serving and holding the Beatitudes! Behold my humble statement of a Day of Light! Fragments taken from his book: “Meeting the Virgin Mary in Betania”, “Encuentro con la Virgen María en Betania”, Nihil Obstat signed by Father Jesus Hernandez, Central Vicar of the Archdioceses of Maracaibo in 1993. This testimony of how I met the Blessed Virgin Mary, I write because after having passed a prudential amount of time, I have waited to verify the cancer with metastasis healing, by all the medical examinations of laboratory, radiology, ultrasound and biopsy, which were all repeated. It is a need, an obligation, and a Christian responsibility that I feel from the deepest and inner part of my soul. I have faith and I know that ‘the Blessed Virgin Mary continues preceding the People of God’ (John Paul II), that travels towards the center, norm, goal, and fullness that is Christ […]. On February 1989 the urinary symptoms were more frequent; I had to get up at night 3 or 4 times to urinate, and I had lost a little weight. Immediately, they asked for a PSA (Prostatic-Specific Antigen) blood test that marks tumors. If it is high it is malignant; the result was 100. The normal values are from 0 to 6. So, I had a feeling, since the result was so high, that I not only had prostate cancer, but that I also had metastasis. In effect, the bone survey of 02-23-89 informed: A rounded image of greater lateralized activity exists. It corresponds with a vascular pedicle located at T12 level. The rest of the skeleton is without abnormal growth. Dr. Vinicio Paz. At T12 level an image of bone density loss is identified, metastic type of 4,2 cm. in its longitudinal axis by 2,4 cm. In its transverse axis it has a clear edge of intense inflammatory infiltrative reaction. Pelvic evaluation: Augmented prostate of heterogeneous aspect, nodule of 2,5 cm. protruding towards the bladder. There are no signs of alteration of the retrovesical space or rectal ischium fosses. Dr. Eduardo Mora. Diagnosis: Adenocarcinoma well differentiated, prostate infiltrating. Dr. Amable Garcia. The examination with my friend and doctor in Urology was characterized by a sense of solidarity and consolation on his side; and grief, sadness, furtive tears, and great fear on mine. 1. Radiotherapy of the column: immediate, to avoid its fracture. 2. – Flutamid: antihormonal medicine, which only had 2 years being used with good results to stop the fast progress of the metastasis. 3. – Chemotherapy: with antitumoral drug combination. That night of the medical meeting on the day of 03-06-89 I felt I was sentenced to death: 63% of mortality the first 2 years and 81% from 1 to 5 years. That is to say, 5 years of life in the best of cases […]. At that time I was a man of dominical Mass and Communion: A common Christian […]. After that despicable night of the medical meeting, in my inner and intimate reflections, when speaking to God, imploring his mercy, I set my mind on going to Mass and to Communion more frequently, not only weekly, fervent prayer of the rosary, and daily reading of the Word of Jesus; and thus I did. – Chemotherapy: first cycle the 04-14-89 and second cycle 05-05-89. In May, Teresita de Andrade, a cousin, visits me and invites me to travel to Betania, where the Virgin Mary has been appearing since March 25th of 1976 and, with more frequency from March 25, 1984, and where miraculous healings happen all the time. She informs me that the pilgrimages are directed and led by Judith de Ramirez, a common friend. It was then when I began to feel the great power of prayer over me: my own, from my relatives, friends, patients of my medical practice, groups of prayer, the group of the Franciscan Sisters of the Presentation, the Carmelite Sisters of San Cristobal, the Catechists Sisters of Lourdes of Maracaibo, and the daily rosary of the Catholic radio station: the Voice of Faith. All the family insisted on the pilgrimage to Betania. I “embarked on” the pilgrimage. From the beginning at 6:00 a.m., the time for departure, Judith began with morning prayers, and my mind immediately reacted saying: This good woman is going to make us pray for 12 hours without rest, patience. I feel so bad, nausea, perspiration, and weakness due to the second chemotherapy I had a week ago, that I am not going to be able to bear this trip. We arrived at Finca Betania at 6:15 in the afternoon. We disembarked far from the grotto and from the site of the apparitions. We went to greet the Virgin. We prayed and we sang. In the route to the grotto and cascade I felt a supernatural perception of peace, inner tranquility, and calmness. We began the night of prayer, and to fast from 7:00 p.m. to 7:00 in the morning. We were 250 people at the place. Within me, discomfort had accentuated itself. I sweated more and more, and I felt the chills. I layed down to rest on the ground on a small mattress. Cartesianly I responded: Please, stop being over-pious, we are in a mountain area, and that is a very natural phenomenon. I resisted leaving the world of reason. During the midnight Mass, the Eucharist, and the Homily that began on May 13, 1989, feast of the Virgin of Fatima, torrential rain came from the actual grace […]. We agreed to rest and to then pray during the night-watch. I woke up at 3:00 in the morning, when a group of young people entered the sanctuary, singing in an angelical choir: LONG LIVE JESUS, THE LORD. They prayed and sang. I sweated and shivered. I briefly prayed. I Slept by exhaustion […]. I woke up again at 4:00, when they sang once again: LONG LIVE JESUS, THE LORD. I slept deeply again […]. At 5:00 I woke up but this time I was eager, like by an inner intuition, I hear: LONG LIVE JESUS, THE LORD. I was shivering and sweating abundantly. There is nothing sweeter than to feel the call of Jesus. This third time I cried, I do not know why but with my face on the ground. Fervent and humbled at the face of love. Humanized as brothers of Christ, between the call, surrendering and repentance. A plea emerged from the most intimate, deepest feeling of my being: Lord, here You have me like Paul of Tarsus, knocked down from the horse of my pride, vanity, and the exercise of my profession. I have not killed nor persecuted Christians as Paul… but I have become lukewarm, mediatized of indolent and non-communicative fervor of the grace […]. Lord, give me more time to be with my smaller children, Vinicio and Julio, studying a career they can use to forge ahead on their own. Lord, give me that time for them, and for my family, not for me. You know that I accept your will. After this plea of mercy, I prayed in thanksgiving: Our Father, an invocation to the Holy Spirit, Hail Mary, Creed, and Glory Be. At 6:00 a.m. we, those who traveled from Maracaibo, gathered ourselves in front of the grotto to sing and to pray the rosary to the Virgin. When ending the holy rosary, two children said that the Virgin was in between the trees all dressed in white in the grotto of prayer. Many began to see the apparition. I cling to my wife and I say: Virgin, by the merits of this holy woman I need to see you. And the silhouette of the Virgin of Fatima appeared between the trees full of white and shinning light; majestic, beautiful and impressive with sweetness. Intense coldness and then heat crossed and shook my whole body. I told Elena very softly: My love, I am going to be cured, I felt it within; I do not know when, but I am going to be cured. The apparition of the Virgin of Fatima was brief, perhaps less than a minute. I was left full of faith, sure of my healing, of warm well-being, calmness and tranquility. It is daybreak and the morning begins. It is cloudy, there is an absence of sunlight […] one could calculate 5,000 people […]. The day began to become clear because of the light that showed itself through the clouds. It is 8:20 in the morning. The crowd begins to scream: “The sun, sun… signs in the sun, signs in the sun.” Suddenly to the left of the hill of the grotto and the cascade, beyond the summit of the trees, in the open and multicolored sky, the Blessed Virgin Mary began to appear like a real person, like a human being, as I knew that she should manifest herself. I exclaimed: My God, I am seeing the Virgin Mary. Thank you, my God. And I abruptly fell on my knees […]. I cried of joy […]. Infinite peace, happiness and joy overwhelmed me […]. All thought, reason, consciousness, and the heart were taken by the love for Mary. She appeared […] with a light-brown dress from her neck to her feet. The Child Jesus in her right arm in an attitude of surrender, and a suspended rosary on her left arm, shining and refulgent. I did not know the title, nor had I seen it before. I am being cured, I continued exclaiming, as long as I was contemplating the Virgin. I mentally expressed: O Virgin, thank you, thank you, thank you, I love you, I venerate you, I beg your forgiveness. Thank you, Jesus the Savior. Filled of love and happiness I was able to speak to her: Holy Virgin, give me a sign to go to the doctors and tell them that I am cured. For noon Mass, celebrated by the Bishop Pio Bello Ricardo, an image was brought in procession, MARY RECONCILER. Then we all recognized the title of the apparition. In order to refer to all the testimony of my healing and my meeting with the Blessed Virgin Mary, Elena and I decided to have a reunion in the house with our relatives and friends. The following day, Tuesday, Nelia de Rodriguez called Elena and she tells her that she will send the image of the Virgin of Perpetual Help […] and thus the visit announced by Maria Esperanza is fulfilled. Throughout the day, flowers sent to the Virgin Mary by friends – without asking for them – were received. That night there were 12 bouquets of flowers. We prayed in thanksgiving and I gave testimony of my meeting with the VIRGIN. He looked at me as if I had lost all reason, but he extracted the blood sample. I spoke to Dr. Vinicio Paz, he had done the test twice, and the results were: “NONDETECTABLE.” I asked him: Do you think that with 2 chemotherapies and 10 sessions of radiotherapy in the column, all the malignant cells can be eliminated, so much so that the immunological reaction disappears? On 05-22-89 they did the Computerized Tomography of the Column with the following result: At T12 level the image of 1,3 cm. is identified again. In its longitudinal axis by 1,2, in its transverse axis with reactive sclerosis, prominent in adjacent vertebral body, in left para-media region with extension to proximal portion. Pelvic examination: prostate of normal size, of homogenous aspect with good boundary of vesical level are signs of alteration of the retrovesical space or rectal ischium fosses. The result of the Echogram was: The prostate measurement is approximately 3,7 x 3,5 cm. It presents two tiny central calcifications and a slight irregularity on anterior face, the glandular texture is homogenous with scarce protrusion to vesical floor. I asked for the opinion of Dr. Eduardo Mora. How do you find the metastasis of the column? I responded: Eduardo, I went to Betania, I saw to the Virgin Mary and am cured. One week later, the bone survey reported: Images of abnormal accumulation of radioactive layout in the skeleton are not observed. Dr. Vinicio Paz. “That star, Alfonso, is the Virgin Mary, the most sublime star of love for all men,” I responded. Four years have passed [when the book was issued] from that merciful event. Every 4 months I do the corresponding examinations, all of which have been: “NONDETECTABLE.” That is to say, no cell with malignant activity. I affirm, freely and diaphanously, that I have personally met the VIRGIN MARY RECONCILER, and that I only yearn to occupy time, space, and action in pleasing Our Lady and Christ Jesus; essential, true and central point of our thoughts, feelings and actions. I am cured physically and spiritually. I have faith in Christ and I have faith in myself, living by the grace of God. I am in peace with myself, my family and with all men, my brothers. GLORY BE TO GOD.